The market did make a new low as expected by the main count, but not by much. Price moved only about 150 pips lower, coming nearly 30 pips short of reaching our first target. A bullish hammer candlestick formed on the daily chart as the week ended, accompanied by a subtle bullish shift in momentum. This led me to consider the possibility of a bullish reversal as my main count, but it’s not enough on its own to discard the possibility of a small bearish continuation, which is what the alternate count covers. You’ll notice that I made a slight modification to the wave degrees. I think the new labeling is slightly better from a technical perspective, specially given the recent developments. And since it coincides almost perfectly with the targets and general expectations of the previous labeling, which means there shouldn’t be any confusion, I felt I might as well keep you up-to-date on my latest views. The bigger picture sees that the euro is moving generally toward the upside in maroon wave B, which is forming an expanded flat labeled black waves A, B and C.
The following daily charts zoom into the details of blue wave 4. 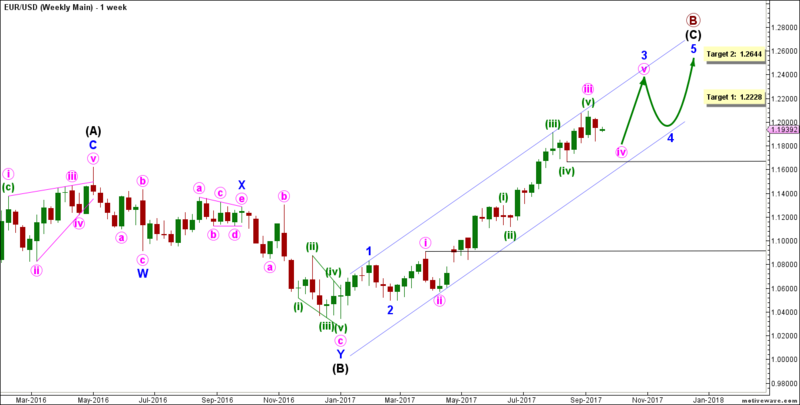 The main daily count sees that blue wave 4 completed a zigzag labeled pink waves a, b and c.
Pink wave b retraced exactly 78.6% of pink wave a. Pink wave c formed an impulse labeled green waves (i) through (v). Green wave (iii) reached exactly 161.8% the length of green wave (i), and green wave (v) reached almost exactly 61.8% of its length. These very typical wave relationships are the reason I consider this count to be a better fit than the alternate. Now blue wave 5 is forming either an impulse or an ending diagonal labeled pink waves i through v.
This count expects the euro to be moving toward the upside in blue wave 5. This will be largely confirmed by movement above 1.1832. At 1.2157 blue wave 5 would reach 100% the length of blue wave 1, then at 1.2459 it would reach 161.8% of its length. 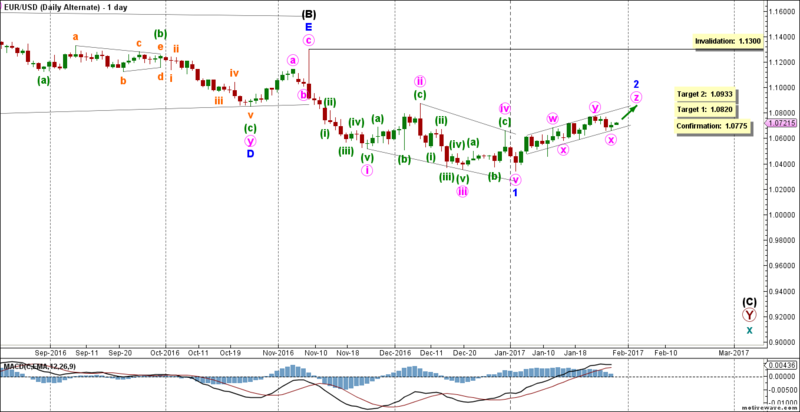 This wave count is invalidated by movement below 1.1669 as pink wave ii may not move beyond the start of pink wave i. This alternate daily count sees that blue wave 4 is still unfolding a zigzag labeled pink waves a, b and c.
This count differs from the main count in that it sees that pink wave c is forming an ending diagonal labeled green waves (i) through (v). Green waves (i), (ii) and (iii) each formed a zigzag labeled orange waves a, b and c.
Green wave (iv) will probably take a day or two to complete. It should find resistance around 1.1770, and ideally it will remain below 1.1785. 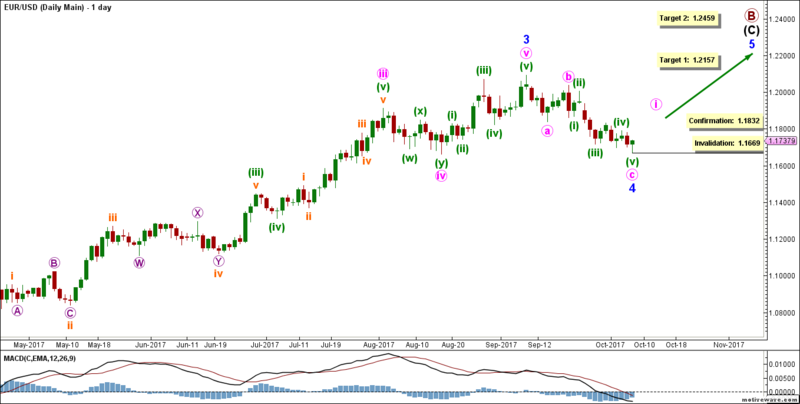 This count expects the euro soon to continue moving toward the downside in green wave (v) to complete pink wave c. This will be confirmed by movement below 1.1669. There’s no Fibonacci relationship between green waves (iii) and (i), so I don’t think there’ll be one between green waves (v) and (iii), either. At 1.1623 pink wave c would reach 161.8% the length of pink wave a. This wave count is invalidated by movement above 1.1832 as green wave (iv) may not move beyond the start of green wave (iii). The market moved generally sideways over this past week, apparently completing the contracting triangle we’ve been tracking in the fourth-wave position of the current uptrend. My impression is that the triangle is now complete, or at least very near completion, which would place the market in a position for a continuation of the trend. But since triangle are pre-terminal patterns (meaning, they appear in the next-to-last position of a trend), I wouldn’t expect this continuation to be particularly long-lived. On the other hand, even though the triangle pattern is the most fitting count at this stage, it’s not the only one possible for this correction. We may easily be looking at a more complex type of correction. Our alternate count covers this possibility, and the invalidation point of the main count serves also as a confirmation level for this alternate count. The main daily count sees that pink wave iv is most likely forming a running triangle labeled green waves (a) through (e). It’s either complete or very near completion. 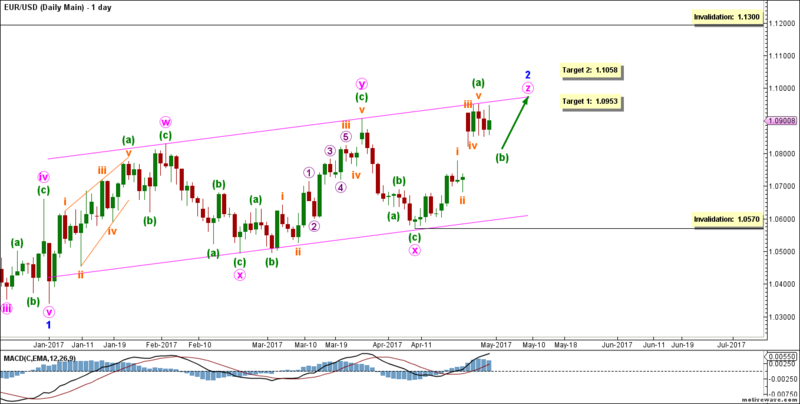 This count expects the euro to resume moving toward the upside in pink wave v to complete blue wave 3. This will be confirmed by movement above 1.2036. At 1.2116 pink wave v would reach 61.8% the length of pink wave i, then at 1.2274 it would reach 100% of its length. This wave count is invalidated by movement below 1.1837 as green wave (e) of this contracting triangle may not move beyond the start of green wave (d). This alternate daily count sees that pink wave iv is forming a double combination labeled green waves (w), (x) and (y). Green wave (b) either formed a double combination labeled orange waves w, x and y, which would be now complete, or is still forming a contracting triangle that should be very near completion. 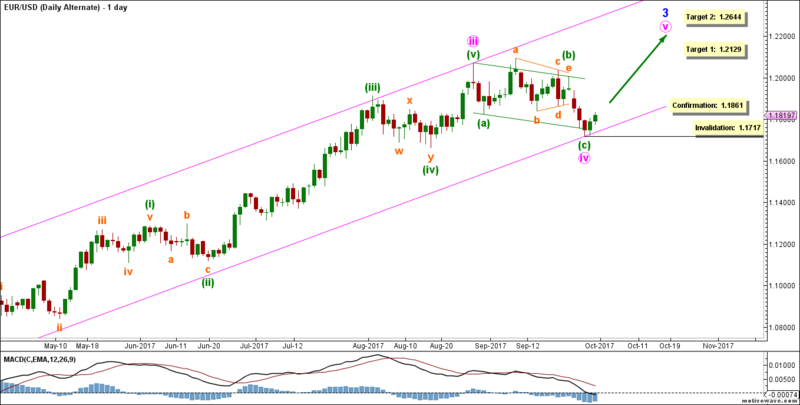 This count expects the euro to be moving toward the downside in green wave (c) to complete pink wave iv. This will be confirmed by movement below 1.1837. At 1.1789 green wave (c) would reach 100% the length of green wave (a), then at 1.1636 it would reach 161.8% of its length. This wave count is invalidated by movement above 1.2036. After making a very slight new high, the market spent this last week moving downward. And just before it touched the previous low, it started moving again toward the upside. This all fits nicely within our primary count from last week. But this decline seems a little too strong to be the fourth wave of the ending diagonal I originally assumed was unfolding. A better-fitting count is that a running/barrier triangle is unfolding in the fourth wave position of one larger degree. On the other hand, this larger-degree fourth wave may very easily turn out to be a more complex correction, possibly a triple combination or some variation of a flat. There’s really no point in trying to cover every possible variation of the correction, so this week I’m going to focus on the one most likely count, but I’ll keep the invalidation point at a more lenient position to allow for the other possibilities. Unfortunately, I can’t present solid targets for the upside until the triangle is complete. But at least we know that, once the triangle is complete, price will invariably exceed its highest point. Pink wave iv is most likely forming a running contracting triangle labeled green waves (a) through (e). Green waves (a), (b) and (c) are most likely complete. If this triangle scenario is correct, then the market should find support at the low of green wave (c) at 1.1837. 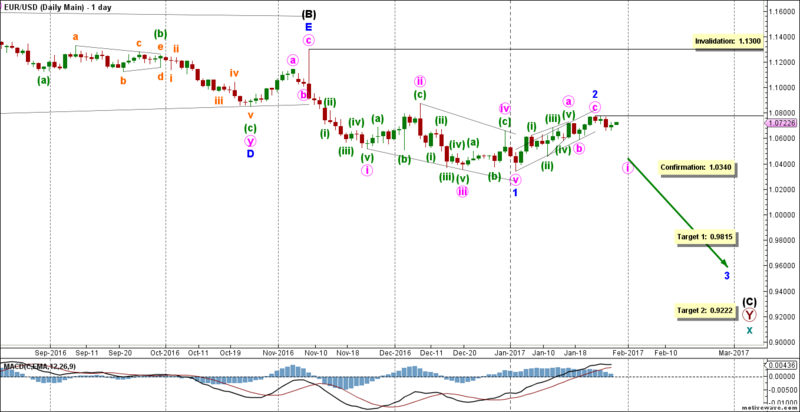 This count expects the euro finally to continue moving toward the upside in pink wave v to complete blue wave 3. 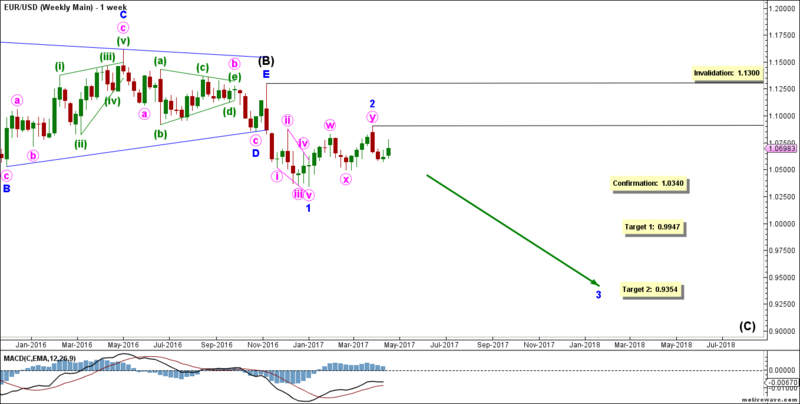 At 1.2092 pink wave v would reach the high of the previous green wave (b), then at 1.2150 it would reach the approximate length of the previous green wave (b) — which was the largest segment of the triangle. These are best-fit targets at this point, and they’ll be updated once pink wave iv is confirmed to be complete. This wave count is invalidated by movement below 1.1837 as green wave (e) of this contracting triangle may not move beyond the start of green wave (d). 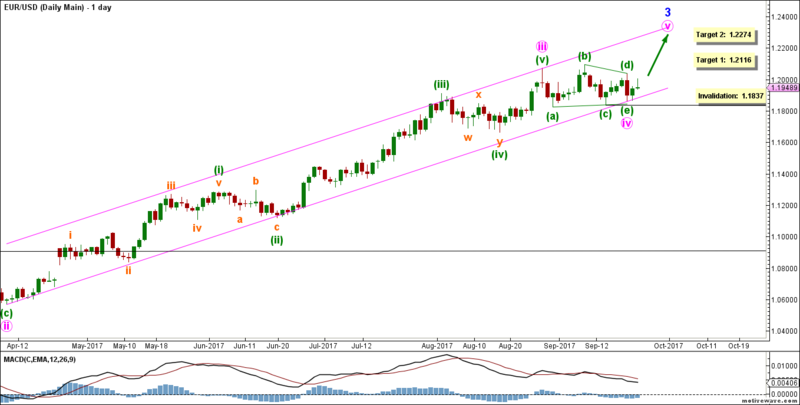 However, pink wave iv itself would be invalidated only by movement below 1.0906 as it may not enter the price territory of pink wave i. 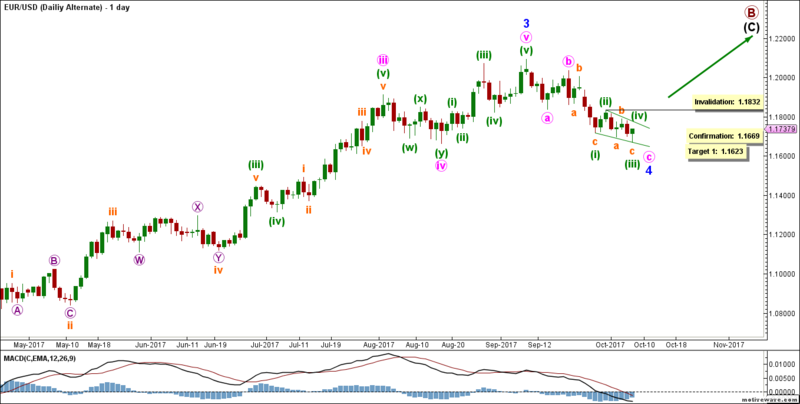 Since my last weekly analysis of the euro and its ongoing struggle with the U.S. dollar, the market has seen significant appreciation in price as well as interesting developments in its pattern. So far pink wave iii has just exceeded 100% the length of pink wave i. This count expects the euro ultimately to move a bit further towards the upside in pink waves iii, iv and v to complete blue wave C, and therefore black wave (C). This will be confirmed by movement above 1.1300. At 1.1393 blue wave C would reach 161.8% the length of blue wave A, then at 1.1422 black wave (C) would retrace 78.6% of black wave (B). 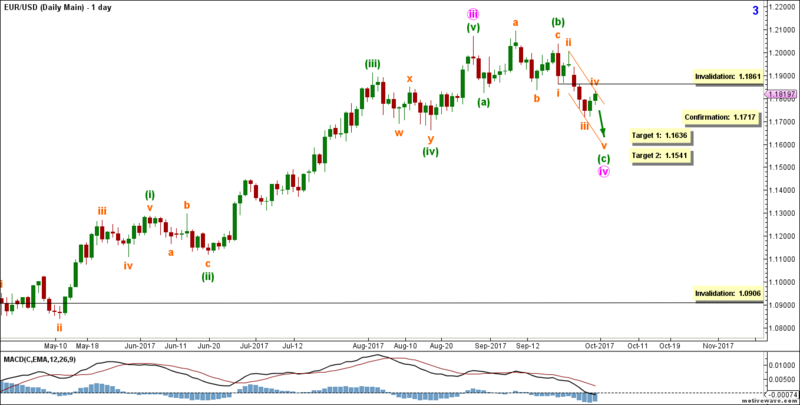 By moving below 1.0603, EUR/USD is expected to move down to find support between 1.0441 and 1.0233. 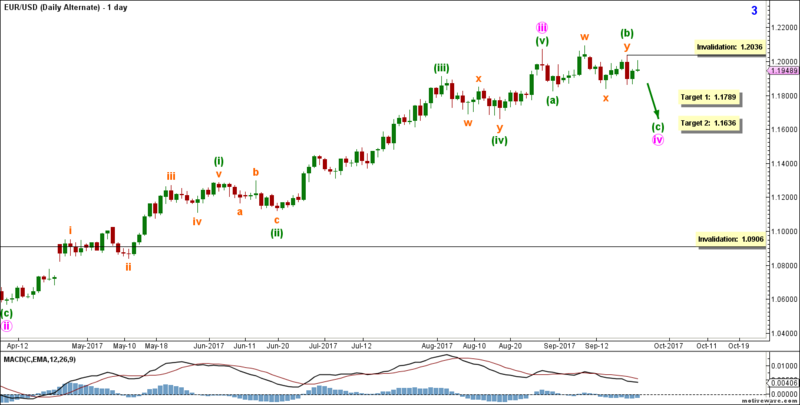 The market should remain below 1.0906, and it’s likely to find resistance around 1.0777. The bigger picture sees that the euro is moving towards the downside in black wave (C), which is forming an impulse labeled blue waves 1 through 5. 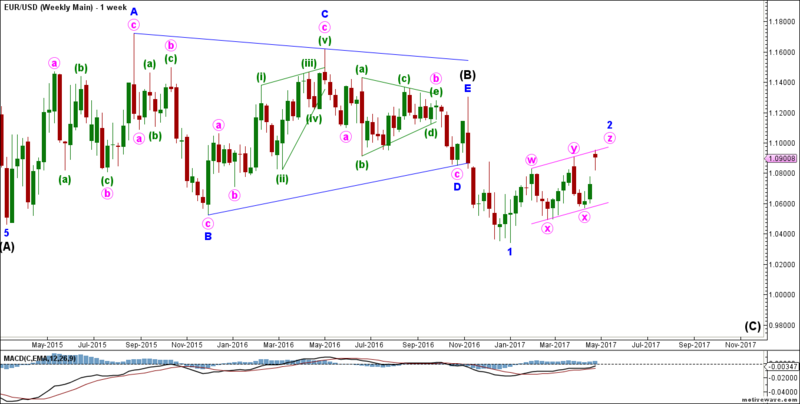 Blue wave 2 formed a double zigzag labeled pink waves w, x and y. It retraced 61.8% of blue wave 1, and it’s most likely complete. 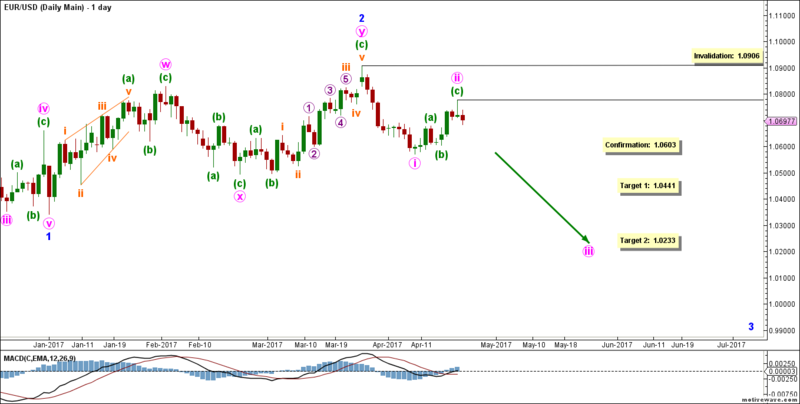 This count expects the euro to moved towards the downside in blue wave 3. This will be confirmed by movement below 1.0340. At 0.9947 blue wave 3 would reach 100% the length of blue wave 1, then at 0.9354 it would reach 161.8% of its length. As price moves below our confirmation point, we may lower the invalidation point to the end of blue wave 2, which currently stands at 1.0906. This count sees that blue wave 3 is forming an impulse labeled pink waves i through v.
Pink wave ii formed a zigzag labeled green waves (a), (b) and (c). 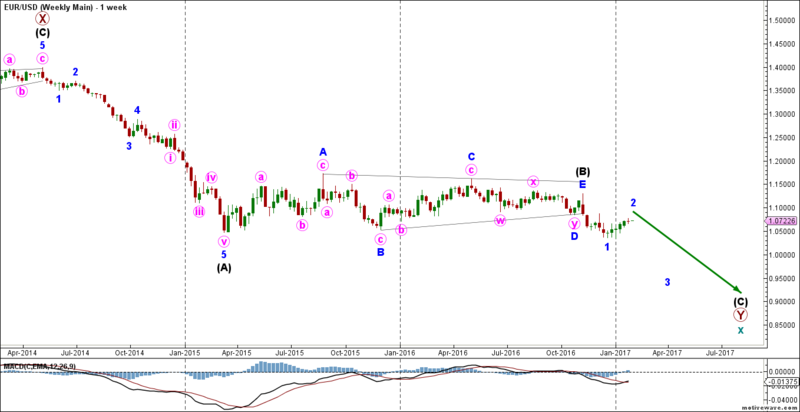 It retraced precisely 61.8% of pink wave i, and it’s most likely complete. 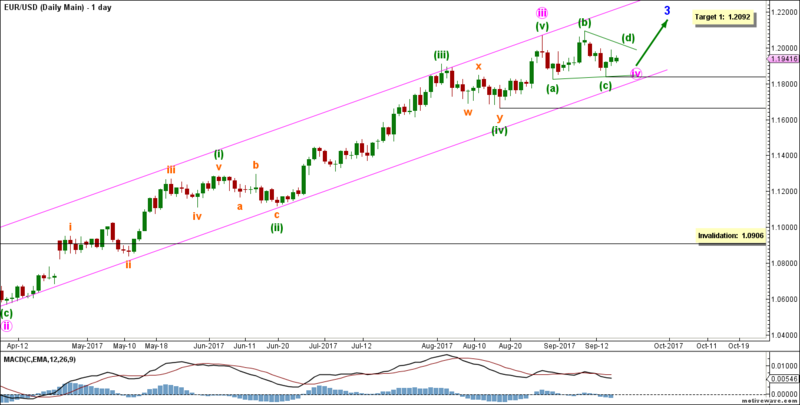 This count expects the euro to move towards the downside in pink wave iii. This will be confirmed by movement below 1.603. At 1.0441 pink wave iii would reach 100% the length of pink wave i, then at 1.0233 it would reach 161.8% of its length. 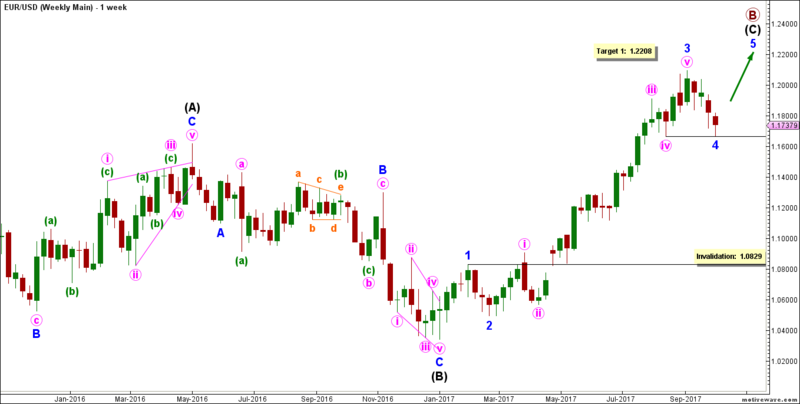 This wave count is invalidated by movement above 1.0906 as pink wave ii may not move beyond the start of pink wave i. As price moves below our confirmation point, we may lower the invalidation point to the end of pink wave ii, which currently stands at 1.0777.